Teresa Vega was born and raised in Brockton, Massachusetts. After attending college in Brunswick, Maine, she moved to New York City to work on her doctorate in anthropology. After many years of studying and teaching anthropology, she decided to change careers. Teresa comes from a family of women who sewed. She started quilting in 1996. Her first quilt was based on an original design. 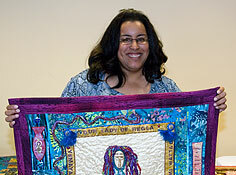 Not long after she made her first quilt, Teresa had the opportunity to meet some members of Quilters of Color Network of New York (QCNNY) at the American Folk Art Museum and joined the guild as a member. In 2004, she became President of QCNNY. The impetus for her art quilts comes from her identity as an African-American and Puerto Rican woman. She is particularly inspired by the Orishas of Yoruba-based religions — i.e., Santeria, Camdoble, and Vodoun — and creates art quilts that are spiritual/religious in nature. Teresa is a fiber artist who is constantly seeking out new ways to express herself on fabric. She uses mixed media techniques that include using beads, various threads and fibers, charms, buttons, shells, embellished felt, oil paint sticks, wax pastels, fabric paint, dyes, and other embellishments on her quilts to create a textured surface. She also adds text to her quilts so that they can "speak" for themselves. Teresa has exhibited both nationally and internationally. She has also been featured in several publications. In addition, she now teaches mixed media techniques and art quilt classes (including Fabric Postcards, Using Angelina Fiber, and Beading and Distressing Fabric for Art Quilts) at different venues around the NYC area.